I've been trying to be healthy lately. It's hard. It's especially hard in the winter, for me, because in the winter my oven calls to be used, calls to slowly warm veggies braised in butter, cakes or cookies. I find winter fruit harder to eat consistently, and I tire of root vegetables eventually. Winter flavors. But it doesn't have to be like this. For instance, this Teriyaki Chicken is a year-round pleaser and tonight, I discovered that leftover sauce makes steamed kale to die for. I assume it could do much the same for any wonderful, green vegetable that might not quite stand up on it's own. So even if you're not interested in the chicken, I hope I can interest you in the sauce. It's healthy, it's flavorful, and it's sure to brighten up the grayest of days and the grayest of diets. In a small saucepan, over medium heat, bring the balsamic vinegar, the agave and the pepper to a boil. Reduce the heat and simmer for 10 minutes. Allow to cool, then add the rest of the ingredients. Place chicken breasts into a gallon ziplock back along with most of the sauce. Keep some sauce aside to serve with the chicken, and if you make fewer breasts, you can keep even more for some veggies. Marinate the chicken in the refrigerator for a few hours, and up to overnight. Either grill or panfry the chicken (time depends on the size of the piece) and serve with a sprinkling of cilantro, scallion and a drizzle (or a flood) of the reserved teriyaki sauce. Oh I love teriyaki, I like how your sauce look so glistening. Delicious. That is the richest looking teriyaki sauce I've ever seen, and no wonder - with balsamic vinegar and miso. Wow! I've gotta' try this. 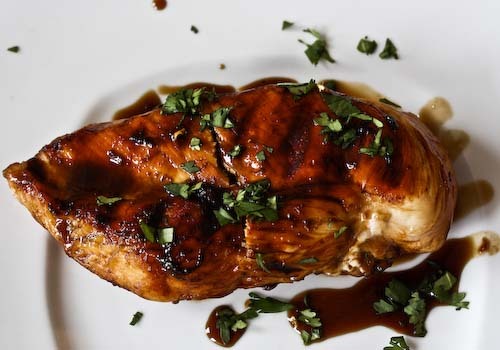 Balsamic vinegar in teriyaki. What an inspired touch! I am definitely going to have to try that. I'm getting bored of winter roots now too, this looks like a great change! 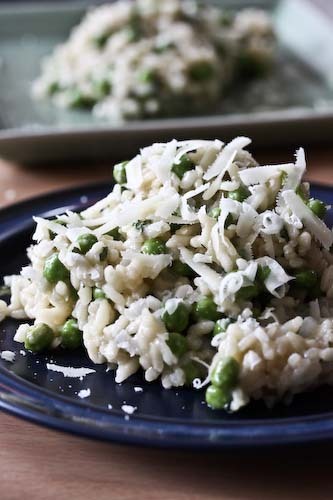 I absolutely making this for dinner tonight... looks so easy and tasty. And thank you for using agave - I bought a huge bottle of it because it seemed to be all the rage and I never use it. I always add balsamic when I make chicken for my mom and dad, they love what it does to the flavors. Thanks for sharing, I'll have to show them this one too! I LOVE that GOOP Teriyaki chicken recipe... I did the detox (works like charm) and I still stick to the overall ideals of what to cut out of the diet! And I make that chicken all of the time! I absolutely am going to have to try your recipe though, that is fantastic! Teriyaki is one of my favorites with chicken. The sauce sounds wonderful!!! Thanks for sharing. I'm on day 5 of the Goop Detox and that chicken is the bomb! I'll be making that recipe long after the diet is over. I will have to try ot your way next time. I agree it's much more difficult to diet in the winter - it's like our bodies crave for stronger food! This looks delish and I love how nicely browned the chicken is. This is the second chicken dish today I've seen with balsamico...yum-world! Yum! For some reason I only eat teriyaki chicken when I go to japanese restaurants, I need to try making it at home. Oh this looks so good! I am also trying to eat healthier, but it is so hard this time of year! This looks like an excellent chicken dish! Maybe you should move to the west coast. It is impossible to eat poorly here since the weather at any time could call for you to be wearing a tank top and shorts (or whatever you wear in hot weather like this). This sauce sounds yummy! I love that it uses agave and balsamic...it's definitely a different take on teriyaki and a really good one. What a beautiful blog you have! I love the design. The teriyaki chicken looks delicious. Balsamic vinegar can make anything taste good, can't it? This looks really good! M and I will have to try this on our next grilling adventure. Elra, glistening, I like that. Thanks! Carolyn, thanks, this is one of my great discoveries of recent times! Gastroanthropologist, I love agave, I LOVE it in tea. I'm going to try to cook with it more as well. Hayley, lucky parents you have! Teanna and Beryl, yes, and the MIso soup was great, too. What a wonderful discovery! Patricia and Kristen, yes the winter is always the hardest. The cold doesn't help either! Sara, this recipe at least is super simple. You'll like it! Esi, yes, maybe I should. Maybe you should stop bragging (no, I'm kidding). I want to move to Cali! When I finally do, will you be my friend?! Tammy, it definitely does. I totally agree! And thank you! Chrissy, yes, you and M can try it. Mwah! I love teriyaki chicken but for some reason I don't like teriyaki over steak. In any event, yours looks delicious! I'm getting ready to make this and bought the ingredients BUT when I bought the MISO, I only found Teryaki Sauce Miso (and is red). Is this the right miso? I'm not sure and I want to make it the same as the recipe calls for. can you help me please. Anonymous, I'm not totally sure, but I really think it will be fine. Finding the right miso can be hard sometimes, so I'd go ahead and use what you have. I'd be very surprised if it ruined anything. Thank you Andrea, When I google Miso it shows a Japanese paste. I will try what I have. I have a spicy/ginger/citrus flavor to the marinade. Does this sound right??? ?